When traversing difficult terrain in a variety of conditions, a great pair of mountaineering boots are imperative. With the right boots, you will be prepared for what you encounter, keeping you not just warm and comfortable, but safe. Finding the best mountaineering boots is key for your upcoming adventures. **Below, you'll find our detailed reviews, but you can also click the links above to quickly check the prices of our top 3 picks for men's mountaineering boots. Mountaineering encompasses a number of activities. When mountaineering, you can be faced with climbing a frozen waterfall, crossing a glacier, or walking up a snowy slope, among many other possible challenges. When participating in mountaineering, even a good winter hiking boot may not be sufficient and you need to strongly consider mountaineering boots instead. Typically, mountaineering boots will be heavier than hiking boots. This is in part because they are larger and also because they are made of more materials than an average hiking boot. Insulation may also be a factor in the weight of a mountaineering boot; while hiking boots may or may not have a layer of insulation, mountaineering boots are built to keep your feet warm and may even have removable liners. Offering a significantly stiffer shank and additional ankle support than what is found in a regular hiking boot, the additional stiffness and support offered in a mountaineering boot is key for carrying heavy loads and will allow these insulated boots to perform well in rough, icy terrain. The stiffness is also important as they must be stiff enough to support climbing on ice with crampons attached. Mountaineering boots are compatible with crampons, which is a big reason why mountaineering boots are the way to go if you plan to spent a lot of time in icy conditions. Crampons will help you to move safely on snow and ice by improving your grip on the surface. While crampons can be used with some hiking boots, all mountaineering boots are crampon compatible. There are different types of mountaineering boots and which will work best for you will depend upon how you intend to use them. You will want to consider the temperatures where you plan to be spending time, whether you will be climbing vertical ice and the length of your hikes, among other things. 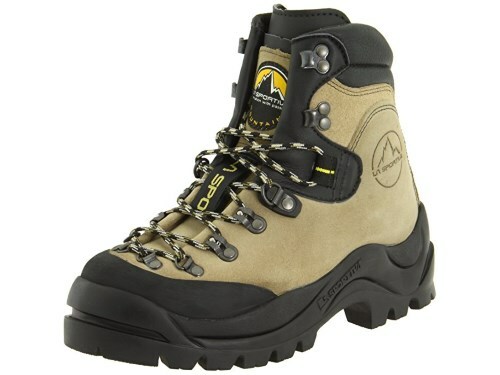 First, there are mountaineering boots with a single upper boot. The upper may be made of multiple layers, however they do not separate. 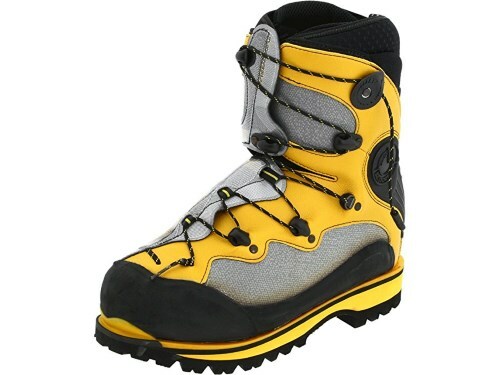 These boots will be the lightest weight of available mountaineering boots and work well for climbing hard ice and rock and are appropriate for a variety of temperatures. Single boots are sufficient for adventures in the U.S. (aside from Alaska) as well as many in Canada and Europe. Some single boots have a completely rigid sole that is reinforced by a full length shank. Others have a semi-rigid sole and are reinforced by a ¾ length shank. The boots with the rigid sole are a good choice for climbing ice along with a variety of conditions that can be seen throughout the year. The boots with the semi-rigid sole are a good three-season option and best for being able to move fast in terrain that is not too difficult. Double boots have an inner and outer boot that can be separated. These are ideal for very cold areas. Not only are they warmer, but the liner can be removed and dried at the end of the day in your sleeping bag, making them warm as you start your next day on the mountain. As these boots have a second layer, they are heavier than the single boot option. Super-gaiter boots have an inner boot that cannot be removed that is covered with an outer gaiter. The gaiter helps provide warmth and protection from the weather and often protects the boot’s laces. Should you be planning to be in conditions that are significantly cold or wet, these are a better option than single boots. These will offer more protection than single boots without the extra weight of double boots. A negative to super-gaiter boots is that it can be challenging for them to dry as the gaiter is attached to the boot. For those who plan to spend several nights in a row in the winter camping in the snow, a double boot may be a better choice. As with a standard pair of hiking boots, part of ensuring that the boot provides the most warmth possible is to choose a pair that fits properly. When selecting a pair of mountaineering boots, it is important that they are not too tight. If the boots are too tight, the ability to move your toes (and your blood flow) will be limited, which will cause your feet to be cold. When trying on boots, do so with the socks that you intend to wear. When hiking in the mountains your feet will typically swell, therefore it is best to try boots on later in the day as your feet will be slightly larger. The right size boots for mountaineering will allow you to wiggle all of your toes about a third as much as you can when not wearing shoes. The video below will help you determine whether a pair of boots are the right fit. Now that you have an idea of what to consider and what options are available when choosing mountaineering boots, let’s review six options of top-rated mountaineering boots for men. Made of Crosta leather, the Fuego Mountaineering Boot by Scarpa is a classically styled leather boot with a vibram M4 tech outsole that is crafted to provide excellent traction in difficult conditions; in fact, these boots are popular among wildland firefighters. These tough boots are suited to heavy work and owning a pair means that you are prepared for whatever conditions you encounter; both on the trails and in life. In addition to a sturdy boot, these men’s mountaineering boots by Scarpa offer a gusseted tongue that provides complete protection and a tall cuff with three lacing eyelets that gives you the ankle support you want when climbing and exploring unknown terrain while carrying a heavy pack. In the Fuego, Scarpa delivers a mountaineering boot that will provide the protection and support you desire while you explore all that the outdoors has to offer. 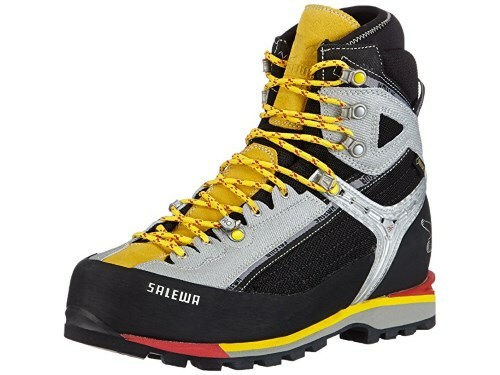 The Salewa Men’s MS Raven Combi GTX M Mountaineering Boot is a polyurethane coated leather boot with a Vibram outsole. With a full rubber rand, and a Gore-Tex inner lining, these waterproof men’s mountaineering boots by Salewa will keep your feet warm and dry while you explore in wet and icy conditions. A 3D lacing system including three automatic locking points make sure that you can customize the fit of these mountaineering boots. The customized fit, in conjunction with the additional heel containment and the boot's compatibility with semi-automatic crampons, provide the stability that you seek when traversing snow and ice. In the Men’s MS Raven Combi GTX M Mountaineering Boot, Salewa has developed a boot that will handle the elements along with any challenging terrain you choose to explore. Ideal for exploring in snowy, wet conditions, the La Sportiva Makalu Mountaineering Boot is a durable leather upper that remains breathable while successfully repelling water. A Dry-Best lining moves moisture away from your skin so that you stay dry and comfortable regardless of the weather that you encounter during your journey. Offering a MtnFlex insole and full steel shank for automatic crampon compatibility, these mountaineering boots by La Sportiva will ensure that you are prepared for all that you may face during a mountaineering excursion or heavy backpacking adventure. Rollerball hardware that includes steel roller ball eyelets and locking D-rings provides the ability to easily adjust the tension of your laces to give you the best fit. These mountaineering boots by La Sportiva will have you prepared for harsh weather conditions and any terrain that you encounter on your adventure. When considering the best mountaineering boots for men, take a look at the La Sportiva Spantik Men’s Mountain Climbing Mountaineering Boot. 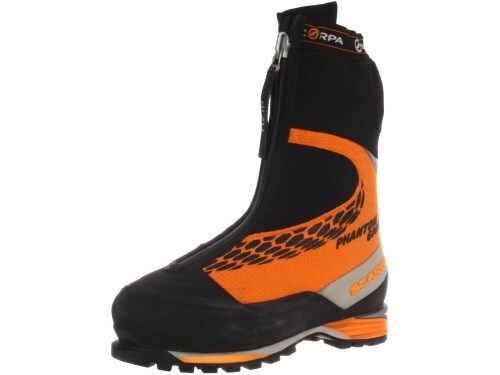 A double boot, a pair of these will keep your feet warm during long treks to the highest peaks. Both the inner and outer boots include water-repellent Lorica® with Antiacqua™ external coating, which work to keep your feet dry no matter how wet the conditions. When exploring significantly cold areas, these boots will ensure that your are well prepared to meet the elements. These double mountaineering boots by Sportiva are step-in crampon compatible and offer the technical climbing capabilities you will need when your adventures involve steep peaks in very cold places. Molded TPU ankle backstay reinforcement provides the stability that you need in rough terrain and the Vibram® rubber rand on the outer boot provides additional traction you require for steep climbs. Well insulated, these double mountaineering boots by Sportiva are ideal for those looking to make steep climbs in very cold temperatures. Interested in a pair of super-gaiter boots? 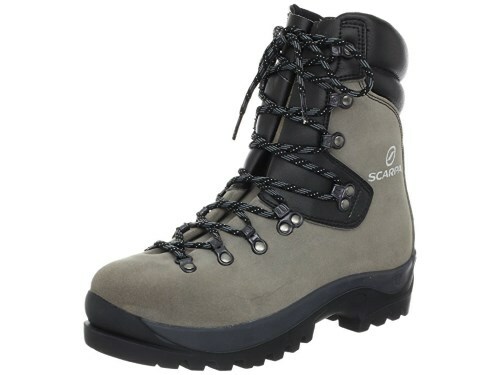 Check out the Men’s Phantom 6000 Mountaineering Boot from Scarpa. These boots offer durability in the face of tough weather with outer material including Schoeller® Kevlar® and Outcry®, as well as a Flexseal ® waterproof closure. A 4mm-EVA inner boot will help your feet remain warm no matter the temperatures you face. These super-gaiter mountaineering boots by Scarpa offer a straightforward quick lacing system with Dyneema cord that gives you the ability to adjust to your particular comfort and stability. Designed with an ErgoFit System, the boots deliver omni-directional progressive flex that allows for natural motions with ideal support. Both automatic and semi-automatic crampon compatible, these boots are ready to handle whatever is in front of them. With the integrated gaiter, enjoy an extra layer of protection from the wet conditions with the Scarpa Men’s Phantom 6000 Mountaineering boot. Comfort, support and performance are all a part of the Solomon Men’s SLab X Alp Carbon GTX Boot. 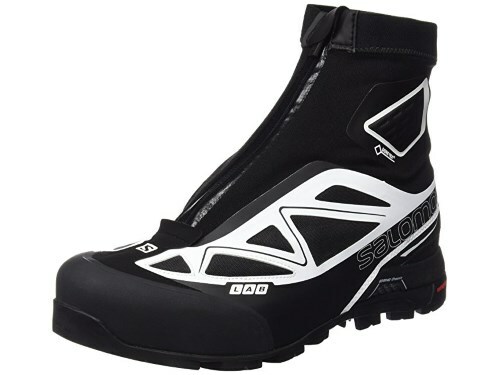 A waterproof upper made of nubuck leather, these mountaineering boots by Salomon include a zip gaiter with a lycra collar, a GoreTex breathable membrane and a waterproof bootie textile lining, keeping your feet dry as you explore the outdoors in all sorts of conditions. These mountaineering boots for hiking developed by Salomon deliver comfort during extended journeys with an Ortholite footbed, and two layers of compression molded EVA midsole. Rubber toe and heel caps, along with ankle pads, provide protection for your feet as well as the boots themselves as you embark on the adventures that you desire. When seeking a lightweight boot with an integrated gaiter, the Men’s Slab X Alp Carbon GTX Boot is a solid choice. 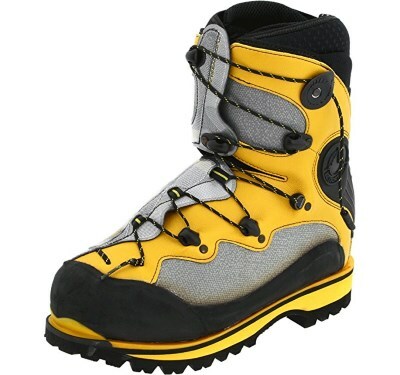 Our top choice is the La Sportiva Spantik Men's Mountain Climbing Mountaineering Boot. While the other options reviewed are solid choices, this double mountaineering boot is designed to keep your feet warm and comfortable in the coldest of temperatures. These mountaineering boots by Sportiva are step-in crampon compatible and offer top traction and performance for the steepest of climbs. Providing the stability you need through special features like heat moldable liners, a fast lace system and molded TPU ankle backstay reinforcement, these mountaineering boots deliver what you need to achieve your mountaineering goals.